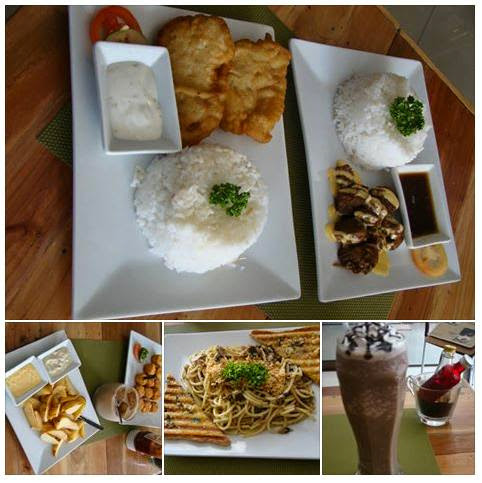 At Tipsy Beans, you can eat, drink, and be merry! According to Stephen Alvin Gueco (who co-owns it with his brother, Patrick Lorenz), Tipsy Beans is not your usual coffee shop as it incorporates liquor in its menu offerings. Tipsy Beans is proof that booze has a true home in the kitchen. While alcohol evaporates away during cooking, it gives dishes that extra pleasant flavor. The Delectable Sisig Triangles with chips is one of Tipsy Beans’ signature sandwiches that you wouldn’t want to miss. Biting in its crunchy bread gives a perfect delight for sisig aficionados. I love its combination of spice and liquor! Potato hips were light and crispy. Beer Battered Fish Fillet (P 80.00) is fish fillet altered to fit a malt snob's tastebuds. Spicy Tuna Pesto (P 120.00)is my favorite. The booze gives its sauce an unexpected extra taste that is flavorful. Drunken Hungarian Sausage and Mushroom Pasta is penne pasta in a light cream sauce with sauteed sausage and mushroom slices. It gives a tangy flavor from the liquor used. Potato Wedges and Potato Nuggets offer that perfect bite while waiting for your order or while chatting away with your friends over hot or cold drink concoctions. It comes with 2 dips, the savory cheese and garlic dip. Voot Beer is a must try! Tipsy Beans is a good way to kick up your next party platter. This cozy place can accommodate 30 to 35 individuals on a full day. For only P 4,000 (consumable) the venue may be reserved for intimate gatherings or meetings.